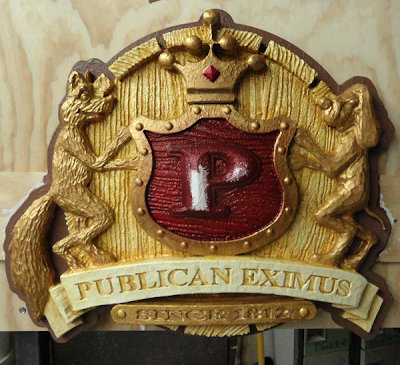 The Paul family crest for the Fox & Hounds Pub is coming along nicely. 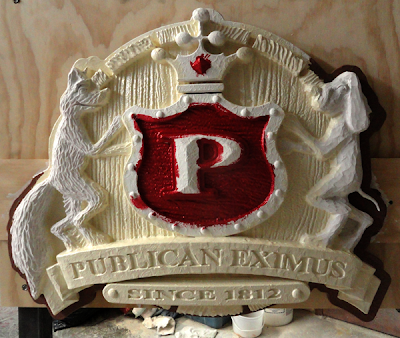 Yesterday we laid on the Coastal Enterprises primer, adding a little more texture with a small brush to the scroll, edge of the shield, crown and the letter ‘P’. This was allowed to dry before we painted the base color of a nice warm cream on the scroll and wood grain background. The shield received a metallic red. The outside border received a brown paint. Today I added the gold to the fox & hound. Then it was time to start the first of the glazes. The shield received a purply red color. The wood and scroll got a yellowish tan for it’s first pass of glazes. Both glazes were gently wiped down to allow the under color to shine through. Tomorrow I’ll start in on the next glazes. working up from the lightest color to the darkest, gradually including more and more of the crest. By the time I am done it will look like it is 200 year old – just like the story we are telling. By carefully designing the project with lots of texture the painting process is relatively quick – less than two hours in total.